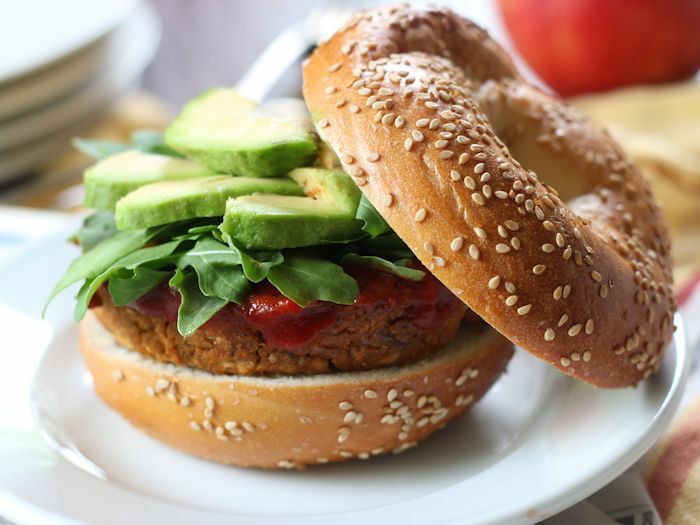 These sweet and savory chickpea veggie burgers are infused with smoky flavor and bits of juicy apples. Enjoy them on a bagel or your choice of bun for breakfast, lunch or dinner. Apparently I’m a little indecisive this week. Yesterday it was on whether or not to make tofu bacon with your vegan mac & cheese, and today it’s on whether this is a burger or a breakfast sandwich. I guess you can tell by the photos that this was originally intended to be a breakfast sandwich, hence the bagel. But then I ate it and declared that it was equally worthy of breakfast, lunch and dinner. So you get to decide. Eat it on a bagel. Eat it on a bun. Hey, you can toss it on a plate and eat it with a fork for all I care, and do so at whatever time of day the feeling hits you. Just be sure to give these suckers a try, because they’re good! The flavor combination here is awesome, but I’ll be honest and say it wasn’t my idea. I got it in my head that I wanted to create a chickpea-based DIY vegan breakfast sausage, and borrowed a flavor idea from Field Roast. Having said that, and keeping in mind that I know very little about breakfast sausage, I don’t think this actually tastes like breakfast sausage. Chickpeas aren’t meat and I won’t pretend they taste like it. The seasonings however, are spot on, and chickpeas, though not meat (which I’m glad of) are totally delicious and satisfying. 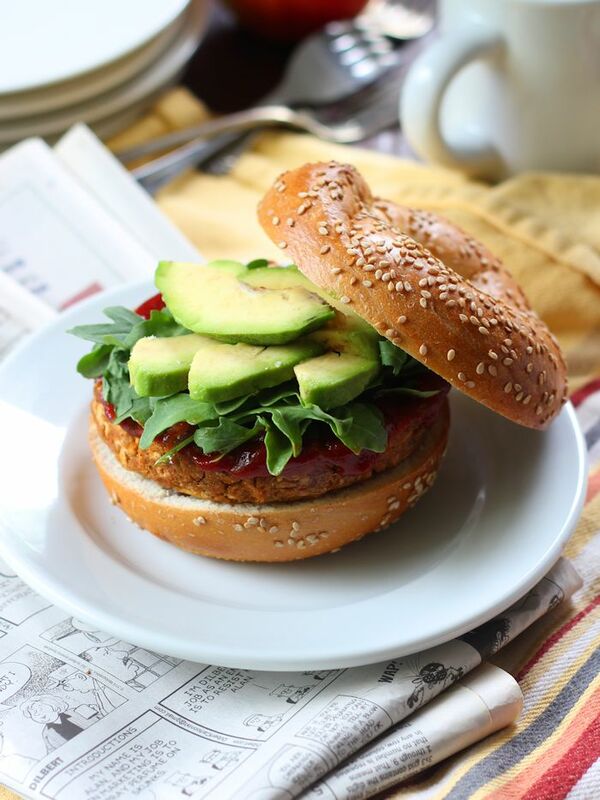 These sweet and savory chickpea veggie burgers are infused with smoky flavor and shredded bits of juicy apples. 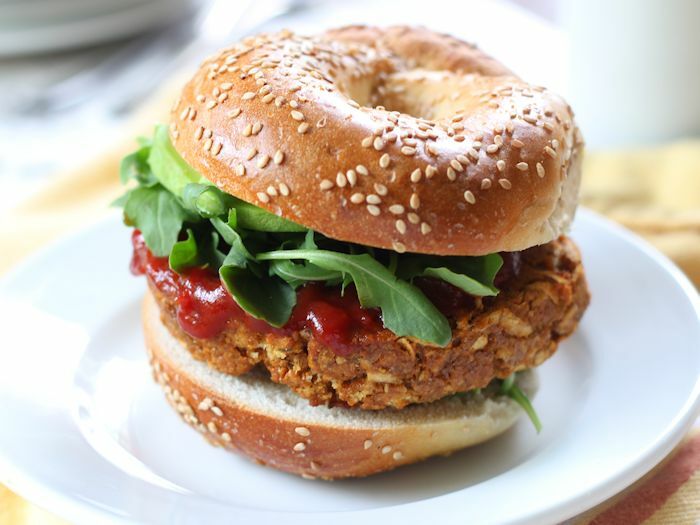 Enjoy them on a bagel or your choice of bun for breakfast, lunch or dinner. Place chickpeas, panko, chickpea flour, onion, garlic, soy sauce, cider vingear, smoked paprika, rubbed sage, thyme, and black pepper into food processor bowl. Pulse until ingredients are well-mixed. Add shredded apple and pulse again just until mixed. Transfer mixture to sealed container and chill 1 hour or overnight. Preheat oven to 400° and line a baking sheet with parchment. Shape the chickpea mixture into 6 patties. Brush tops and bottoms with olive oil. Bake 30 minutes, flipping about halfway through. Stuff into buns, bagels or English muffins and top with toppings of choice. Serve. For a quicker version, you can pan-fry the patties in a bit of oil. I preferred the texture and firmness of the baked burgers, but they're tasty either way. Nutrition information includes bagels. Calories will likely be a bit lower if you use burger buns. This sounds like the perfect fall sandwich. And I am loving that bagel! This looks so good! 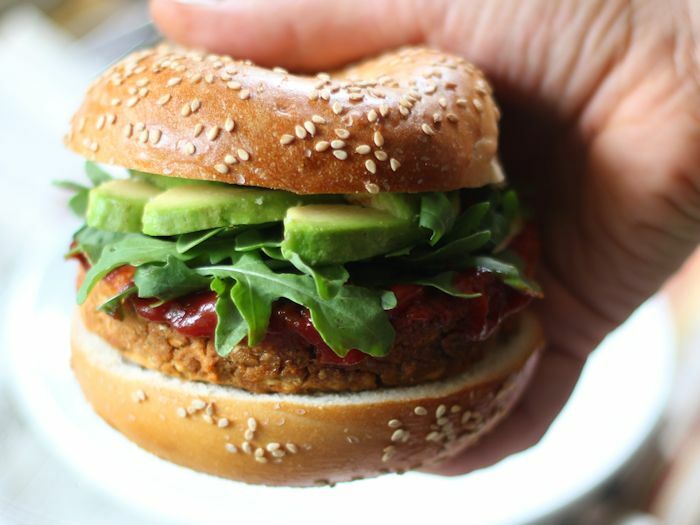 I have always been intimidated at making my own veggie burgers, but this sounds delicious enough that I am willing to try it. I may add some sauteed radicchio as a garnish for the superfood health benefits, plus I think the bitterness would go well with the sweet apple. Thank you for sharing this! A little bit of indecision is good – it means we can legitimately eat these burgers all day every day! This was really delicious, and it was fun to make. I must say, the flavours go together really well. I always meal-prep for a week and with this recipe, I got to make 4 thick patties. My mom was skeptical (so was I) at first about the whole apple thing, but it works really well to balance the flavours of the paprika and sage. I didn’t have quinoa flakes so I used rye flour. My patties became a little thick and not as grainy as what your pictures shows, but you are definitely right about the texture after it has baked–it holds really well! Thank you for adding another staple recipe to my meal-prepping. I’m a fan of yours. Really enjoyed these–easy and delicious! My first veggie burger attempt. Thanks for all the great recipes! 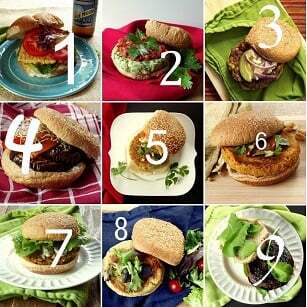 I’m glad you enjoyed them and so happy to hear that your first veggie burger attempt was a success! Thanks Brooke! Hi there, do you think i could use apple sauce in place of shredded apple? Thanks! I’m not sure, but I’d be nervous that they might come out too mushy. If you do give it a try you might need to add some extra panko or chickpea flour to compensate for that! My mixture, after adding the applies, are too mushy, even after they have spent 3 hours in the fridge. Their consistency is like cookie dough not as firm, more like a pate? I haven’t baked it yet because it feels too wet. Any tips? Oh no! Maybe you got a really watery apple. Your best bet would be to add some extra chickpea flour. Made these today and my whole family loves them. My kids thought they were store bought and we are happy to have extra in the freezer. A+!!! Awesome!! I’m so glad they’re a hit!